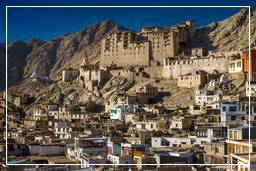 Ladakh stretches between the mountain ranges of the Himalayas (with the Stok Kangri as the most famous mountain) and the Karakorum and the upper valley of the Indus. The valleys are at an altitude of 3,000 m, making them the highest of Kashmir. The mountains reach heights of more than 7,000 m above sea level. Nun, which was climbed for the first time in 1913 at 7,135 m and the neighboring Kun at 7,077 m, which was first conquered in 1906, are the highest mountains in Ladakh. The capital of Ladakh is Leh (about 27,500 inhabitants). Not far from Leh is the Khardong Pass, one of the highest passable passes in the world.